"How to record internet radio? – What’s the best way to record internet radio Mac? Thanks." By moosharoo from Apple Support Communities. There are occasions that we need to record Internet radio Mac like recording wonderful music from a certain online radio station or recording streaming audio on Mac. Apple has provided no direct way for us to record radio stream Mac. So, is there any effective Internet radio recorder Mac or solution to record internet radio Mac? The answer is yes. This post would show you 2 internet radio recorders for Mac users to record internet radio Mac effectively. Though Apple has provided no preset solution for Mac users to record Internet radio Mac, Quicktime Player could actually complete this with the help of certain plugin called SoundFlower, a free Mac extension that allows programs to pass audio to other applications. It acts as an audio device, which allows programs to send or receive audio from it without any other support. 1. 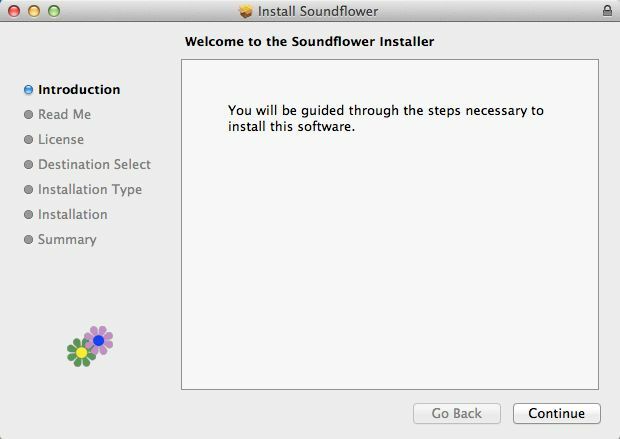 Download and install this Soundflower program by opening the .dmg file and following the on-screen instructions on your Mac computer. 3. 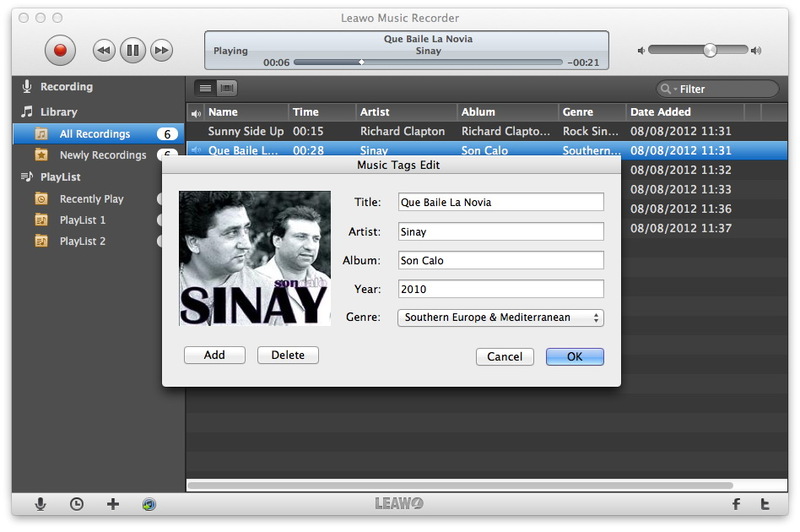 Now open Quicktime Player and click on File > New Audio Recording. Click the little arrow on the side of the Quicktime window. Under the microphone section, click on "Soundflower (2ch)". After that, click the red button and play internet radio to start recording internet radio Mac. 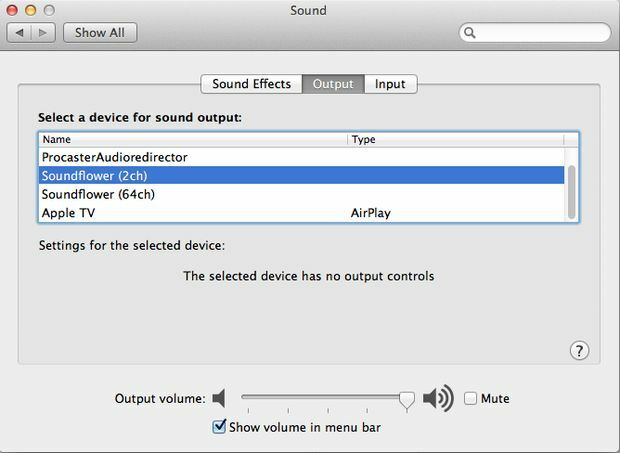 When you’re done and you want to hear audio through your speakers again, go back to System Preferences>Sound>Output, and click on "Internal Speakers." Your audio will now play through your internal speakers again. It seems to be quite complicated to record Internet radio Mac with QuickTime player and Soundflower. That’s why we recommend you Leawo Music Recorder for Mac, a professional music recorder software program for Mac users to record any audio on Mac and save into either WAV, MP3 or M4A. It could perfectly perform as Internet radio recorder Mac program to record internet radio Mac in simple clicks. What’s more, if you’re recording music from Internet radio on Mac, this music recorder software could automatically download and install music tags for recordings. Download and install this Mac audio recording software on your Mac computer and then launch it. The below steps would show you how to record internet radio Mac with this internet radio recorder Mac software. It works on Mac OS 10.6 and later. 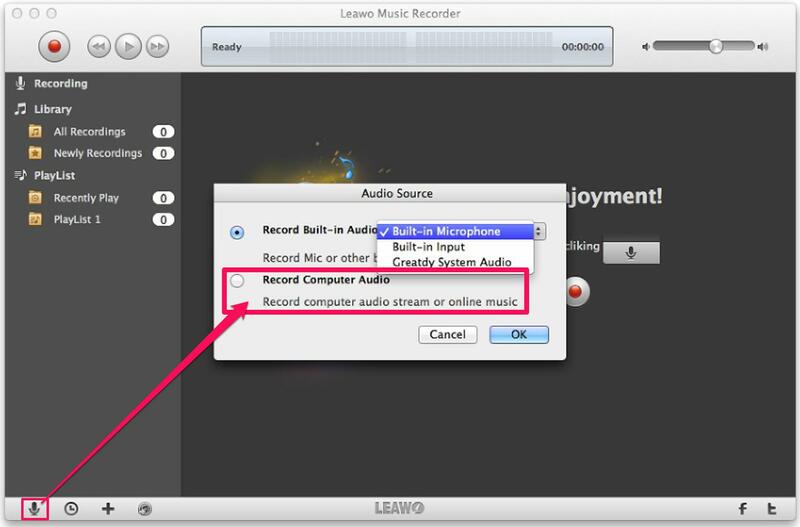 On the main interface of Leawo Music Recorder for Mac, click the little microphone icon and then you come to the "Audio Source" panel. You could see "Record Built-in Audio" option and "Record Computer Audio" option. To record internet radio on Mac, choose "Record Computer Audio" option. 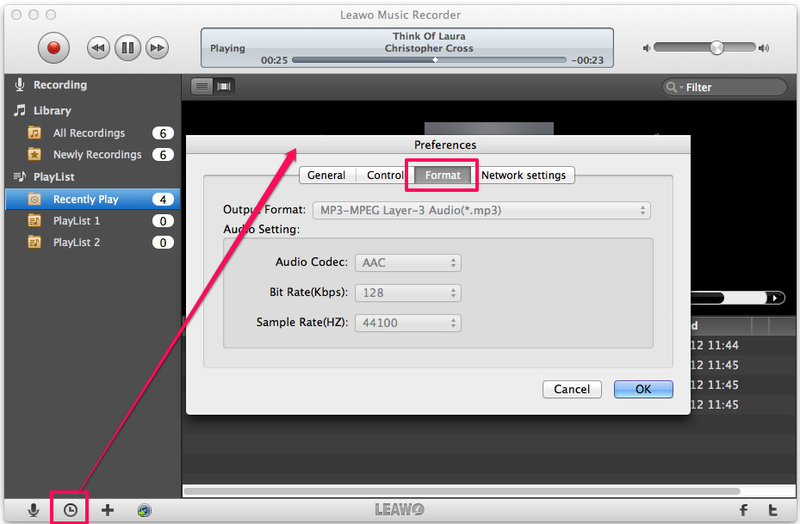 Go to "Leawo Music Recorder > Preferences > Format" to set the output format from MP3 Audio, WAV Audio and W4A Audio. You could change the audio parameters like bit rate and sample rate. After that, go to "Preferences > General" to set output directory to save recorded internet radio audio on Mac. Click the "OK" button to save settings and quit. Then click the red "Start" button to record internet radio while you’re playing it. Leawo Music Recorder for Mac gets a task recording scheduler inside, which enables you to schedule recording by setting its Start time and duration. This would help you record internet radio on Mac even you’re not before the Mac computer. To access to the Scheduler tab, click the second icon from the left at the bottom left corner. Click the red button again to finish recording internet radio on Mac. 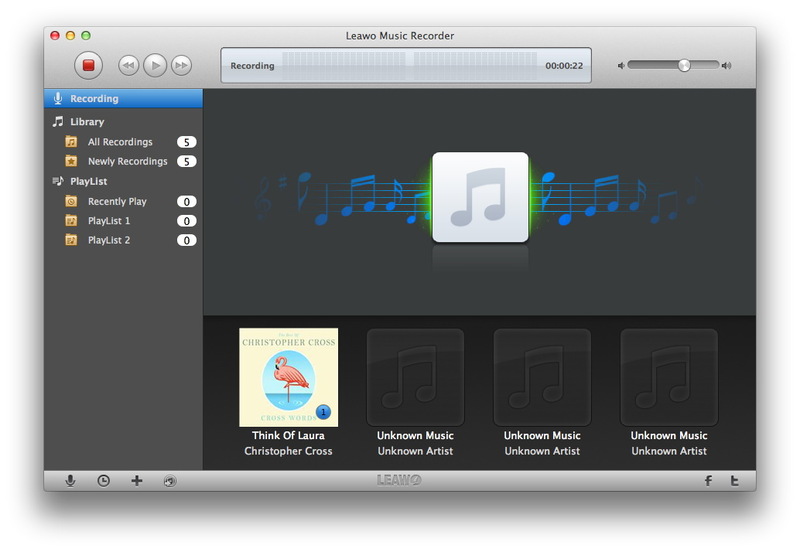 As mentioned above, Leawo Music Recorder for Mac is able to automatically download and add music tags if you’re recording music on Mac computer. But you could still adjust audio tags by entering "Library > All Recordings" to choose the audio recording and right click it to select "Edit Music Tags" option. You could change audio tags like recording title, artist, and genre.